Contemporary Creole dishes and reasonably priced wines at this Uptown restaurant. 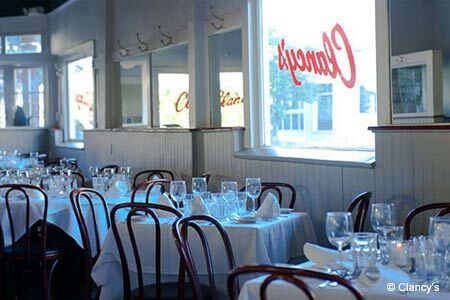 : Uptown swells fill Clancy's whitewashed main dining room of mirrors, bentwood chairs and tuxedo-clad waiters that may strike some as stuffy, but table-hopping is common among the smartly dressed crowd, and the tiny bar up front has a surprisingly robust cocktail culture all its own. Savoring the luxury of fried, golden brown oysters bathed in melted Brie seems fitting in the somewhat austere atmosphere. The kitchen, under the guidance of chef Brian Larson, produces updated Creole dishes, such as a sautéed baby drum with grilled shrimp; grilled chicken breast enlivened with pistachio-lime butter; linguine with crawfish and cream; and filet mignon in a red wine demi-glace with Stilton cheese. Lightly smoked soft-shell crab with a sprinkling of crab meat is an indispensable entrée. Proprietor Brad Hollingsworth's wine list offers domestic and French selections at more than reasonable prices. Fine dessert pies include a towering wedge of peppermint ice cream under a frothy meringue, and a lemon icebox pie that many home cooks would be proud to call their own.